After 2 years OpenText Content Suite had only 10% penetration among the council’s 8,000 employees. The solution was meeting resistance from users faced with a massive change to their business processes. 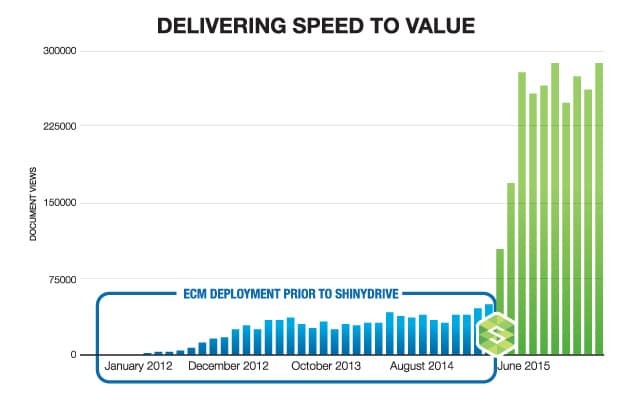 After implementing Shinydrive, Derby City Council doubled its use of Content Suite in month. In two months the use of Content Suite increased nearly tenfold skyrocketing from 35,000 document requests per month to 300,000. Since implementation Shinydrive has enabled Derby City Council to shut down its shared drives, cease Content Suite training, while increasing the number of users utilizing the system, and increasing the amount of content managed by Content Suite.